Thick is the froth that rises to its surface, and smooth is the taste of the stout that pours out. That’s right, Diesel stout will be available in cans starting next week. It’s our second seasonal can release of the year, followed by the inaugural Autumnation for fall. As the leaves fade to black, you’ll be able to find four-packs of these 16-oz cans in grocery stores, delis, bars and restaurants in all markets where Sixpoint cans are sold. But we don’t intend to stop filling kegs of it this winter, either — soon, you’ll be able to score a pint of it on draft as well. 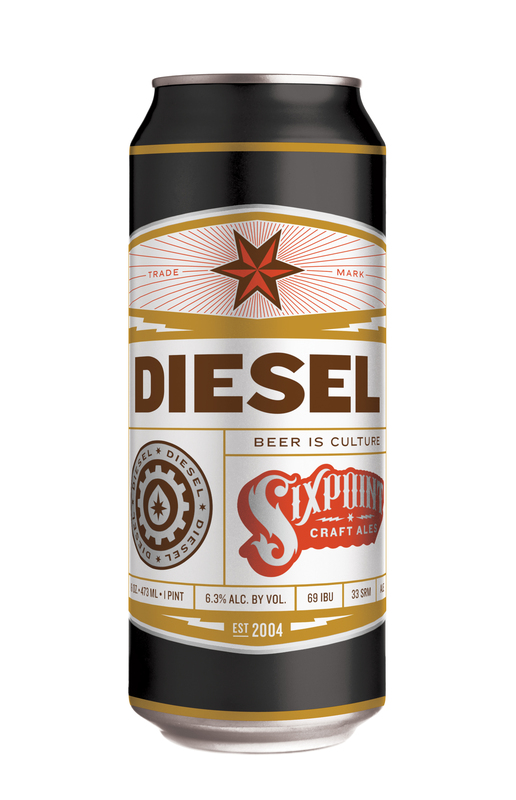 Diesel stout has actually been offered each winter since 2005, the year after Sixpoint was founded. Rich, robust and deep brown-black, this beer will linger in your mouth like a streak of tar. Yet it’s surprisingly sessionable and effervescent, too. It starts with nutty roasted malts, which get combined with Columbus and Northern Brewer hops. Another dose of Columbus in the dry-hopping stage gives it a defiantly hoppy character. Poured in a glass, the head becomes thick and cappuccino-like, with lacing down to the last sip. “Diesel’s the quintessential super-hoppy American stout,” headbrewer Ian McConnell summarized. “It’s always been my number one favorite Sixpoint beer,” said brewer Sean Redmond with affirmation. We’re not kidding you, we truly love this beer. It’s made more than one Sixpoint staffer enjoy stouts for the first time as well. Cheers to a warm winter session at home with it soon.